Indian Railways, being a significant consumer of energy resources, it is important to identify cost-effective energy system options with least environmental impacts. Vision 2020 document of the Indian Railways states that a key target is to utilize at least 10% of its energy requirement from renewable sources. Further, in the Rail Budget 2015-16, it has been announced that : “To reduce dependence on fossil fuels, it is intended to expand sourcing of Solar Power as part of the Solar Mission of Railways. 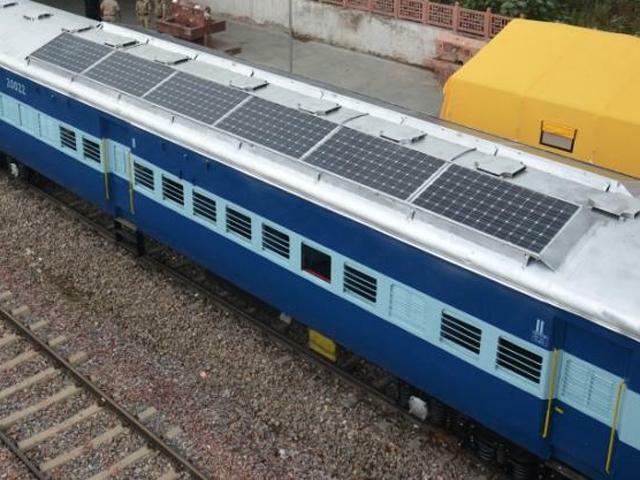 Aiming to materialise its mission to reduce dependence on fossil fuels, the Indian Railways is set to install solar panels in all railway buildings across the country. Indian Railways has been focusing on alternate source of fuels with trials already on to use solar power, CNG, biodiesel and natural gas among others that reduces the operating cost and saves the environment. According to studies, a train using solar power can reduce diesel consumption by up to 90,000 litres per year and also bring down the carbon dioxide emission by over 200 tonnes. 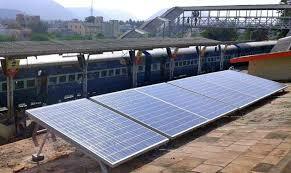 The solar power is expected to significantly bring down diesel consumption for trains and it becomes cost-effective. 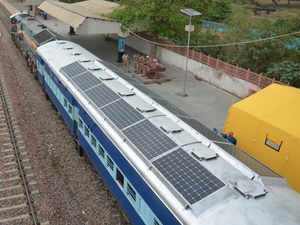 Union Railway Minister Suresh Prabhu has said that in the near future, solar panels would be installed in all railway buildings across the nation. 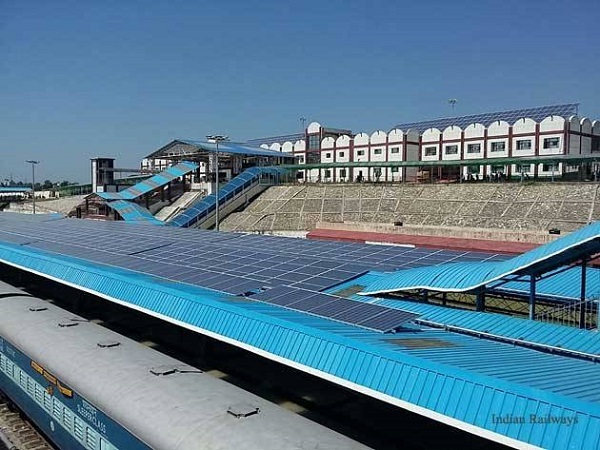 The Minister made this announcement on Sunday when he laid the foundation stone of one Megawatt solar power plant at the Amritsar Railway Station, reports Financial Express. The Railways has already successfully tested train to run at the speed of 180 kilometers per hour and work would now initiate to start high speed train between Amritsar and New Delhi, said The Minister. The Ministry of Railways has also laid down the policy recently for harnessing of solar energy on rooftop of Railway Buildings. 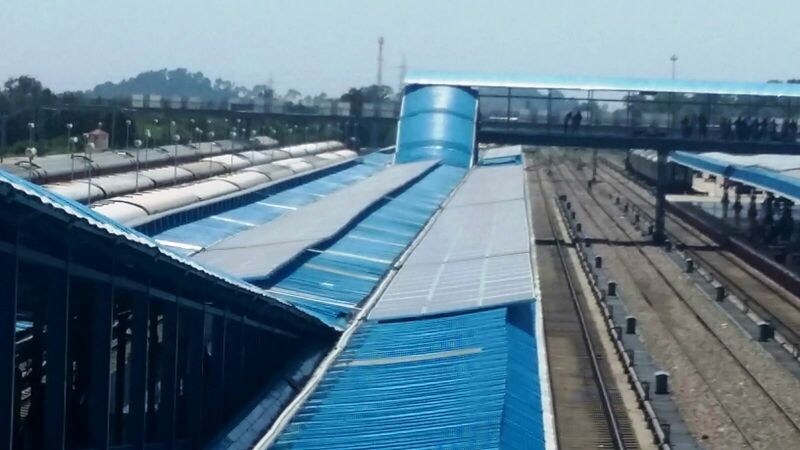 As part of the Solar Mission of Railways it is planned to install 500 MW of solar units on Roof Tops through Central Finance Assistance (CFA) from MNRE and additional 200 MW through assistance from MNRE under PSU scheme, and balance on vacant land for which feasibility study is being carried out, as reported by Irgreenri. Such renewable energy plants are being put up in railways in an economical manner to reduce the cost of energy with viable gap funding from ministry of new and renewable energy. The union government is focusing to produce solar energy from waste materials that would reduce the expenditure of the Railways on electricity, thus providing maximum facilities to the passengers during travel.